First of all I want to wish everyone a Happy Valentine’s Day. I hope it was shared with all the people that you love and hold dear. With that said, I may be a little late with this post, since chocolate is such a big thing on Valentine’s Day. But don’t worry this brownie tart can be prepared no matter what time of the year it is and I am sure you will not hear one complaint. I made this last weekend and took it to my mom’s house for an early Valentine’s treat; I served it up with sweetened whipped cream. It was a nice treat for us chocolate loving family. The original recipe called for walnuts, but I changed them out for almonds and since I used almonds I used almond extract instead of the vanilla extract that it called for. 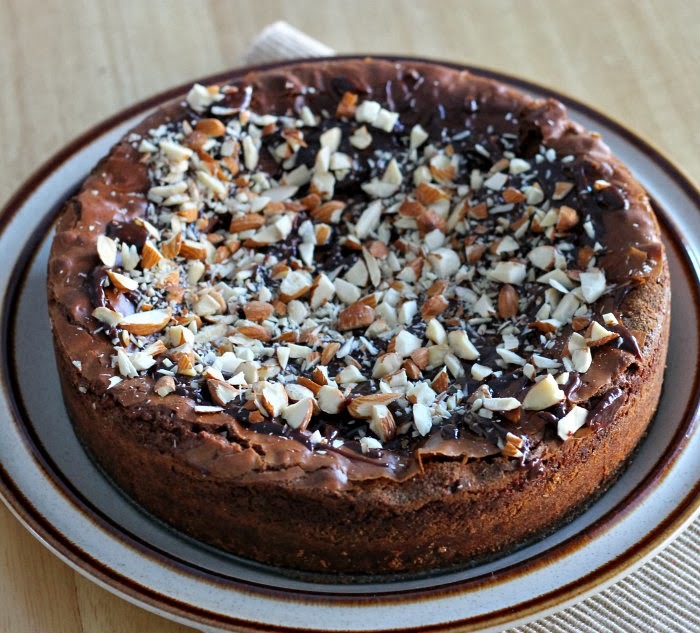 I love the taste of the almond extract as it changes the flavor quite a bit. 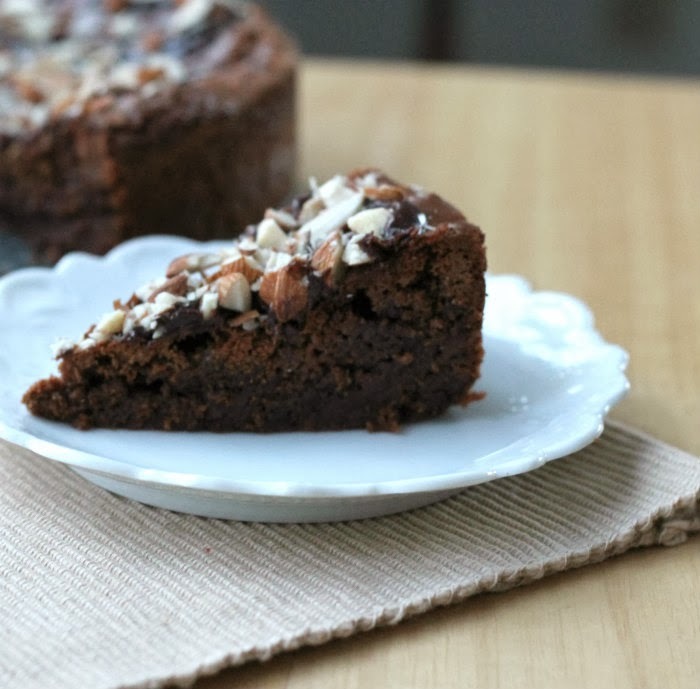 The brownie tart is dense and very fudgy, taste great with the whipped cream or I think a caramel sauce drizzled over top would be a great addition too. Did you make a sweet treat for Valentine’s Day? If you did was it chocolate or some other sweet treat? 1. Grease and flour an 8-inch spring form pan (original recipe called for a 9-inch tart pan with removable sides). Preheat the oven to 350 degrees F.
2. Melt the butter in a bowl set over simmering water. Add the 2 cups of milk chocolate chips, remove from heat and stir until the chocolate melts. Set aside to cool completely. 3. In a medium bowl, beat the eggs, sugar, and almond extract on medium high speed until light and fluffy, about 3 minutes. Stir in the cooled chocolate. 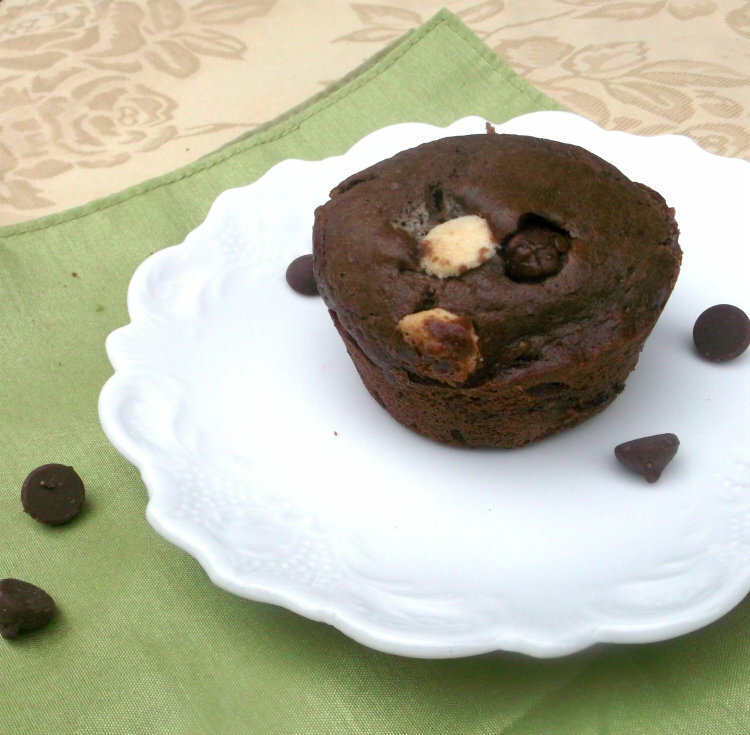 In a medium bowl, combine the flour, baking powder, salt, and the mini chocolate chips. Fold the flour mixture into the batter until just combined. Pour into the pan and bake for 45 to 50 minutes (if using a 9 inch pan bake 35 to 40 minutes), until the center is puffed (the top may crack). The inside will still be very soft. Cool to room temperature before removing the sides of the pan. The center of the tart will fall some but don’t worry it’s okay. 4. Heat the cream to simmer and add the 1/4 cup of chocolate chips, cover and let chocolate melt. Once the chocolate is melted stir until smooth. Drizzle over tart and sprinkle with chopped almonds. 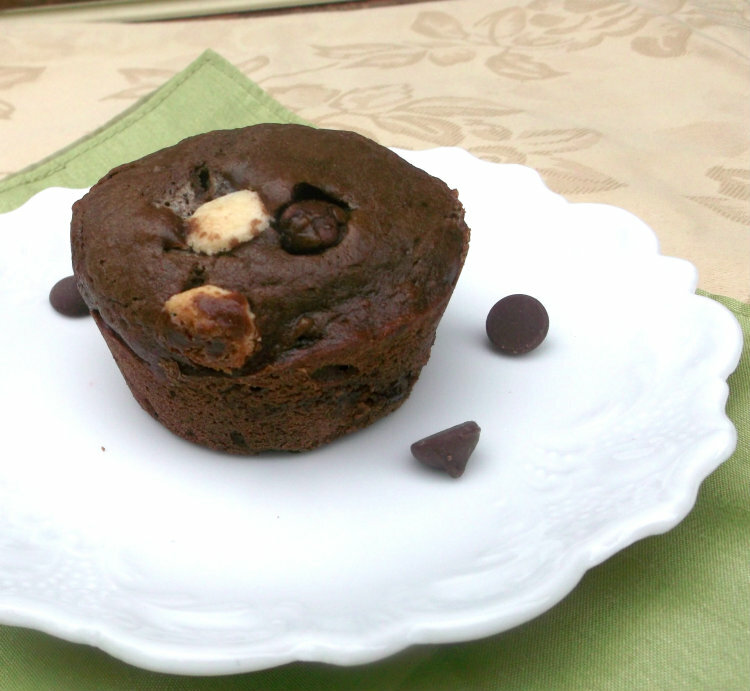 Can you believe it I had never eaten a chocolate muffin before I made my own last week. It seems funny to think that I would not have had at least one in my life time being the chocolate lover that I am. This past weekend I was in the mood to make muffins and I had a craving for chocolate, so I decided it was going to be one of my baking projects for the weekend. When I ask my guys in the house what they thought of my idea; I didn’t get a very positive feedback. Neither one sounded too thrilled with the idea of chocolate muffins, but as you can see my craving won out. Plus the fact I knew the rest of my kids would be around and they are bigger chocolate lovers than these guys are. 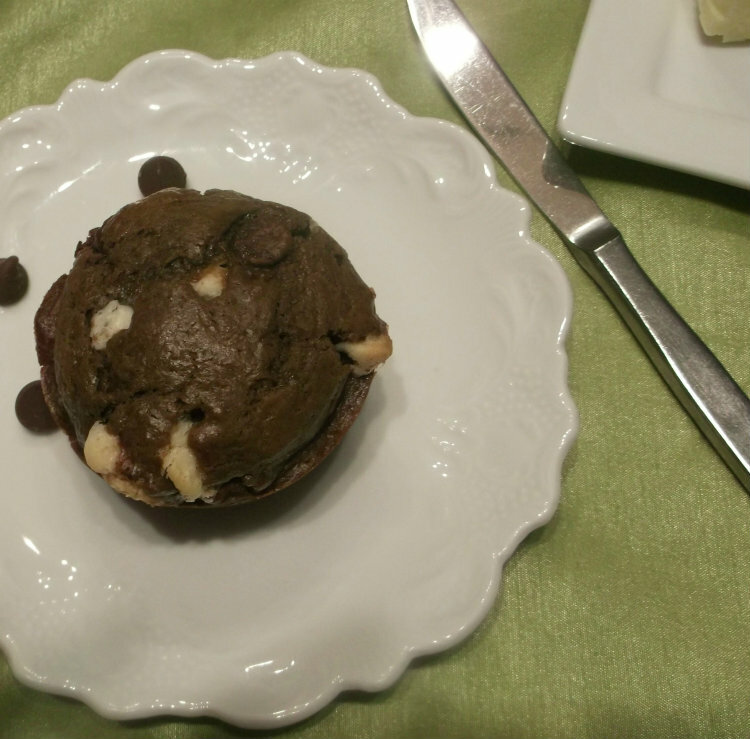 I had some milk chocolate and some white chocolate chips that I wanted to get out of my pantry so I decided to throw them in with the cocoa to make the muffins even better. I had some sour cream in the fridge that needed to be used up so I decided to throw that in too. Maybe these muffins should have been called clean out the cupboard muffins. Well whatever they are called I enjoyed them and I know at least one of the guys in house enjoyed them too. And you know it was not my hubby Mike, since he is not the chocolate lover that I am. In another bowl slightly beat egg and mix in the milk, sour cream, and cooled melted butter. Take the wet ingredients and add to the dry, mix until just blended. Add the chocolate chips and gently fold in. Lightly grease muffin tins or use paper liners. Spoon muffin batter into prepared muffin tins, filling each one 2/3 full. Bake for 20 to 25 minutes. You can use a toothpick to test the muffins if it comes out clean the muffins are ready to remove from the oven. Set on cooling rack and cool completely. Do you ever need chocolate cake, like right now? You can’t wait for the mixing, baking, frosting… then this recipe is for you. 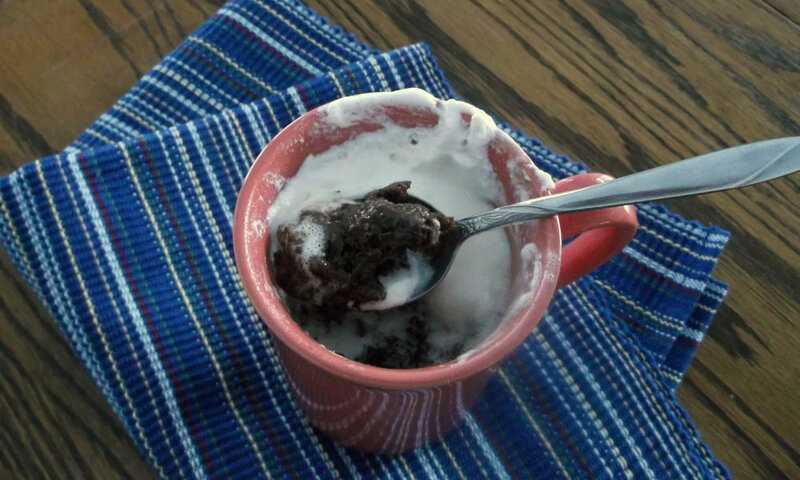 I had one of those evenings the other day, I wanted chocolate, but did not have time to bake and frost a cake. 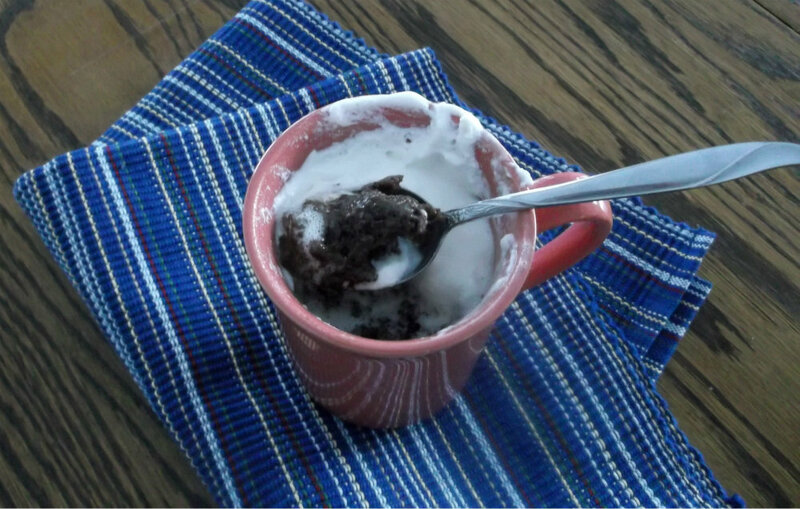 Mug cakes are definitely not going to win any prizes when it comes to the prettiest cake, but the flavor is what counts anyway. And when you need chocolate cake the flavor is what is the most important factor. This cake reminds me of a lava cake or otherwise known as a molten cake. 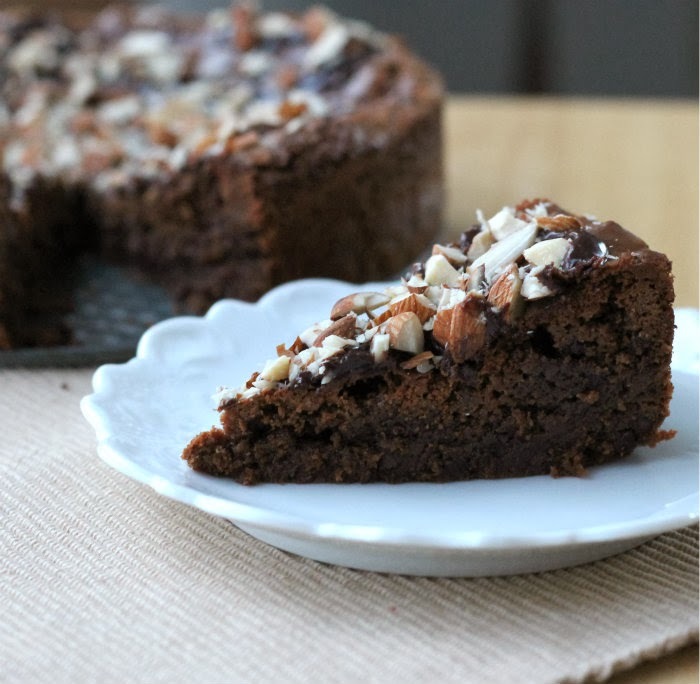 The center was gooey and rich; it sure hits the spot for the chocolate craving. I can guarantee that once you eat this cake you will no longer have any chocolate cravings, you will be satisfied. I added some Rolo candies to my cake, but you can add what you want. The recipe that I used suggested caramels, I think some mint patties would be a marvelous addition as well. But you can decide what you would like to add or maybe you just want chocolate which works as well. And a little whip cream can’t hurt either. 1. In a small bowl add flour, sugar, cocoa, baking powder, and salt. In another small bowl mix the egg, milk, and melted butter. Add the wet ingredients to the dry and stir until blended. 2. 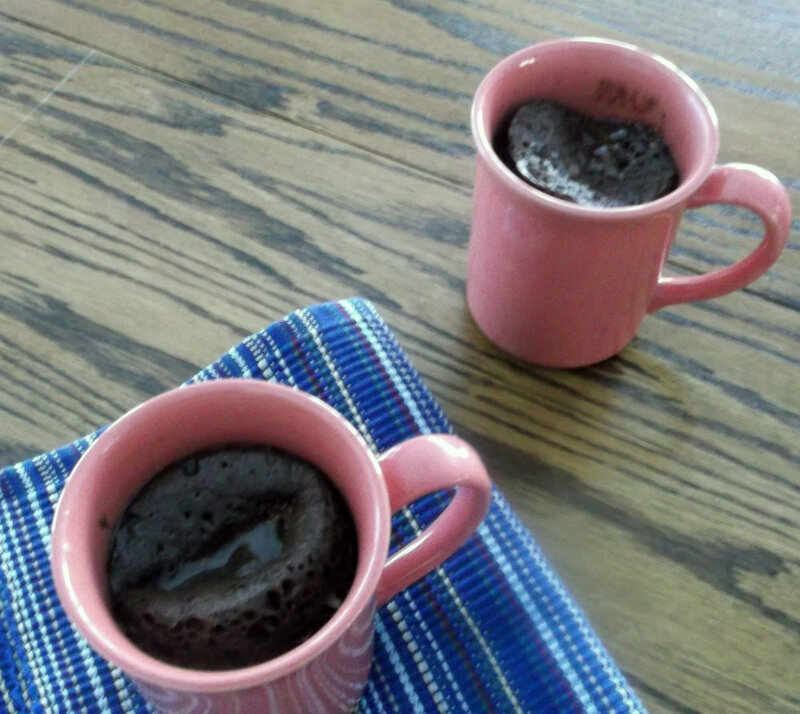 Pour the mixture into a regular sized coffee mug that has been greased with a little butter. Drop the candies into the center one at a time. 3. Microwave on high for 30 seconds. If needed microwave for another 15 to 45 seconds. I like my center of the cake gooey so I did an additional 15 seconds. (It will also depend how many watts that you microwave has). The kitchen has been a busy place these last couple of weeks; with the baking of cookies and making of candies. There have been several nights I think that I was sleeping before my head hit the pillow. It is a lot of work and I may be tired, but I love this time of year. I love the traditions that we carry on and now that we have a grandchild there is another generation that I hope will love the traditions as much as I do. As a child I remember the cookies and the candies that my mom made for our family. My siblings and I looked forward to those treats year after year. And now as an adult I hope our kids look forward to the cookies and candies as much as I did. We have our first granddaughter this year, she is too young to be eating cookies at this time in her life, but I look forward to next year when she gets to sample some of her first Christmas cookies. 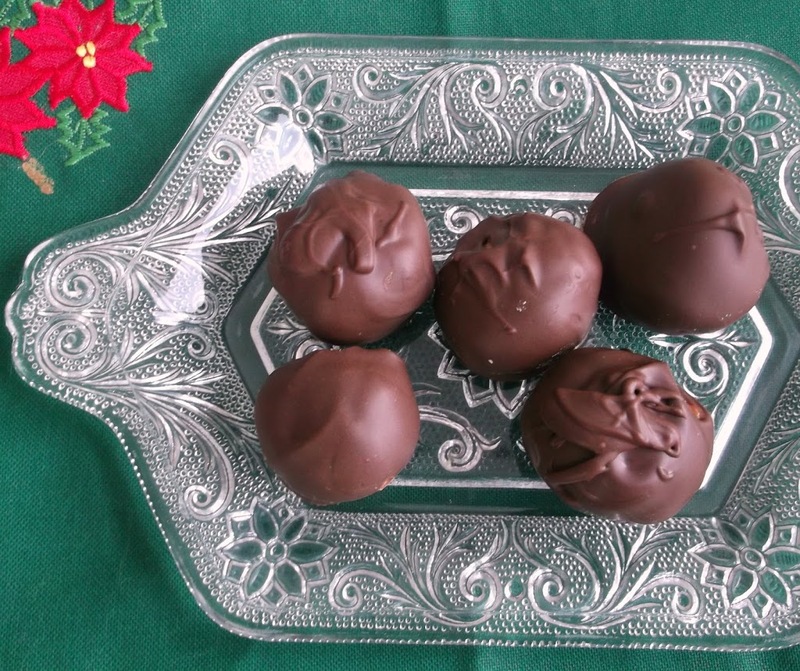 The candy recipe I am sharing isn’t one that my mom made for our family when I was a kid, it actually started with my older sister when she got married and she made these for her family. Then when I met Mike I found out that my mother-in-law made them also. Not everyone in our family likes the chocolate and peanut butter combination, but some of our kids plus my son-in-law adore these candies. 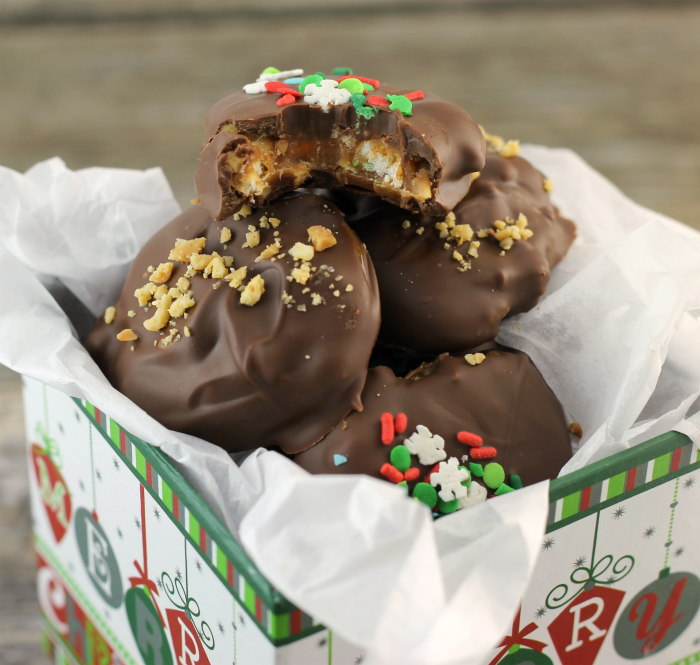 I as well love the peanut butter and chocolate combination, plus I love that they are simple to make. I also want to wish everyone Happy Holidays, may they bring you peace and happiness. With an electric mixer beat the first 3 ingredients until well blended. Roll into balls into desired size. Melt the chocolate chips with the shortening and mix until well blended. 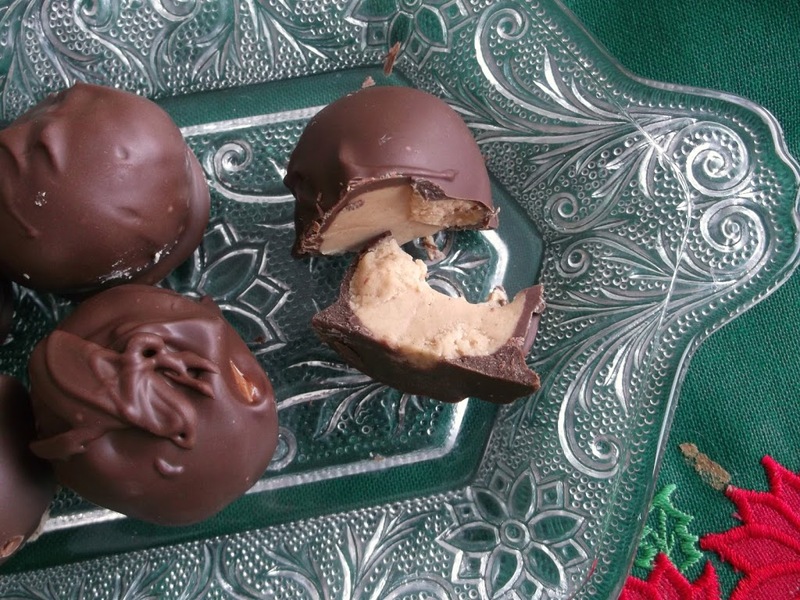 Dip peanut butter balls in chocolate and coat entire ball. 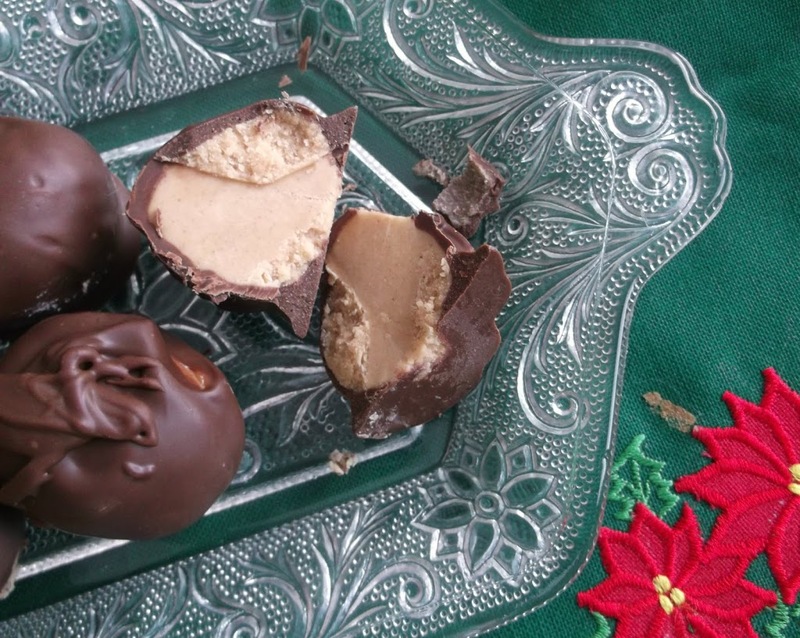 Place on butter cookie sheet and set in refrigerator until chocolate is dry and hardened. Store in air tight container in the refrigerator. Enjoy! !